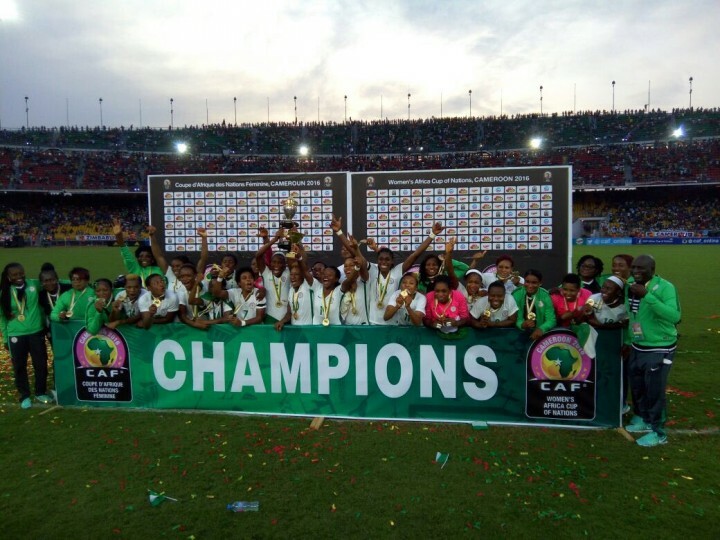 The Super Falcons, winners of the just-concluded African Women’s Cup of Nations (AWCON) in Cameroon, on Wednesday staged a peaceful protest to the National Assembly (NASS) and the Presidential Villa over unpaid allowances. The placard-carrying ladies’, whose protest came on the heels of President Muhammadu Buhari’s presentation of the 2017 budget, refused to grant press interviews. On the placards displayed for passersby, including members of NASS and the executive arm, they urged Buhari to ensure the monies due to them were paid promptly. They described their neglect as pathetic and embarrassing in spite of their sacrifice to the nation, noting that they were about to be ejected from their hotel. They said it was necessary the president waded into the matter so that smiles could return to their faces and for upcoming footballers not discouraged from doing the nation proud. Some of the inscriptions read: “We are begging, please pay us our money’’ and “We have made the nation proud, we deserve to be treated fairly’’. Others are “NASS intervene in our matter please’’ and “Help tell the sports minister to pay us our allowances’’. The News Agency of Nigeria (NAN) reports that some angry Nigerians told journalists at the National Assembly gate, that the government should resolve their problems urgently.